We have compiled a list of facts and details that may help customers become comfortable with carpet terms and definitions. This helps you feel confident in your decision when shopping for your new carpet. Gauge - Gauge refers to the space between the needles on a tufting machine. This measurement is recorded in fractions of an inch and indicates the number of needles that are positioned across the width of the tufting machine. Pitch - Pitch is the space between the stitches made by the needles (the distance which the backing material shifts before the needle punches in the next tuft). It is measured by using the number of tufts per inch. Density - Density is the measure of the closeness of the pile yarns, and it will reveal the gauge and pitch. It is measured by the number of ounces per yard. Usually, a greater density means a higher quality carpet. Face Weight - Face weight is the number of ounces per yard of fiber extending above the primary backing. All of these measurements (gauge, pitch, density, and face weight) are dependent on one another. For example, if the density increases but the pile height doesn't change, the face weight will be greater. Or if the pile height raises with the density staying the same, the face weight will increase. The remainder of this article will provide information on cut-pile styles (59% of the current market), loop-pile types (28% of the market), and cut and loop-pile combination styles (13% of the market). Saxony Pile - A saxony style usually has a pile height close to three quarters of an inch. The most important characteristic of a saxony will be whether the pile is constructed with curled, heattreated yarns with enough density to allow the fibers to keep their shape under foot traffic and furniture. A large number of the luxury carpets produced are of the saxony pile. Plush or Velvet - Plush styles are thick enough to stay strong against regular use. The most important feature of a plush is that there is barely any twist set in the face yarns that make up the pile. 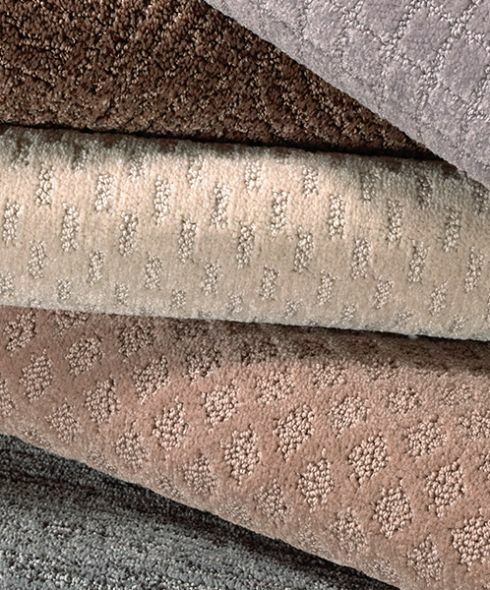 This produces a soft, even texture on the surface of the plush or velvet carpet. This "velvet-plush" carpet should not be exposed to high temperatures in cleaning solutions. Applying these cleaners can chemically burn your plush or velvet. Temperature settings must be lowered from the highest settings. Shag Pile - This type of pile has nearly vanished from modern stores. But for those that argue it still has a place in interior design, there are still some shag carpets that have lasted from the early seventies. A shag carpet will usually have a pile height greater than one inch, but that pile height has to have a low enough density to have that effortless look. The ends of the yarns are on the surface instead of the tips like with many other carpet types. Splush (short-shag or mini-shag) - This carpet is somewhere between the shag and the plush. The pile height is normally around three quarters of an inch. It does not have enough density for the yarn ends to retain their shape when the floor is walked on. The "random lay" look is still very similar to shag despite the fact that the density is greater in this pile type. Frieze(free-say) - This variety is made up of very tightly wound yarns that have a rough, nubby look. Grass-pile - Grass-pile carpets are normally crafted with slit-film olefin which mimics the look of grass. It is sold in dozens of different colors. Level Loop-Pile - This pile type is made up of even-leveled tufts in an uncut or loop-pile design. Commercial quality carpet is usually of the level-loop variety with greater density but less pile height. Multi-Level Loop-Pile - This pile type can also be referred to as "high-low" pile carpet. It is created by increasing tension on the yarn during tufting, which forms designs with high and low loops. Sculptured Saxony - Sculptured saxony is a mix of higher, cut-pile yarns which is different in texture than lower, loop-pile yarns which stay uncut. Sculptured Shag - Sculptured shag is close to the sculptured Saxony. The difference though is that sculptured shag is made up of higher, less dense cut-pile yarns in a shag design, contrasted by lower loops which stay uncut. Level Cut-loop - Manufacturers use this method to make many different types of designs with cut and loop piles of the same height.